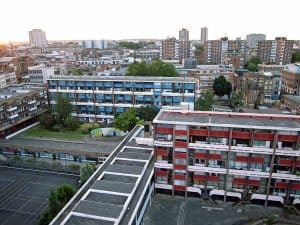 Our man in Golden Lane, Billy Mann, talks about the seemingly ever-present tension around the estate and the implications for residents heading into 2019. It’s not unknown for disasters to strike towards the end of the year. Last year it was the 23 December eruption of the Anak Krakatoa volcano in Indonesia, which caused a deadly tsunami to sweep the coasts of Java and Sumatra. At the same time Mount Etna in Sicily was rattling the city of Catania and pumping out clouds of angry volcanic ash, threatening residents and holidaymakers alike. 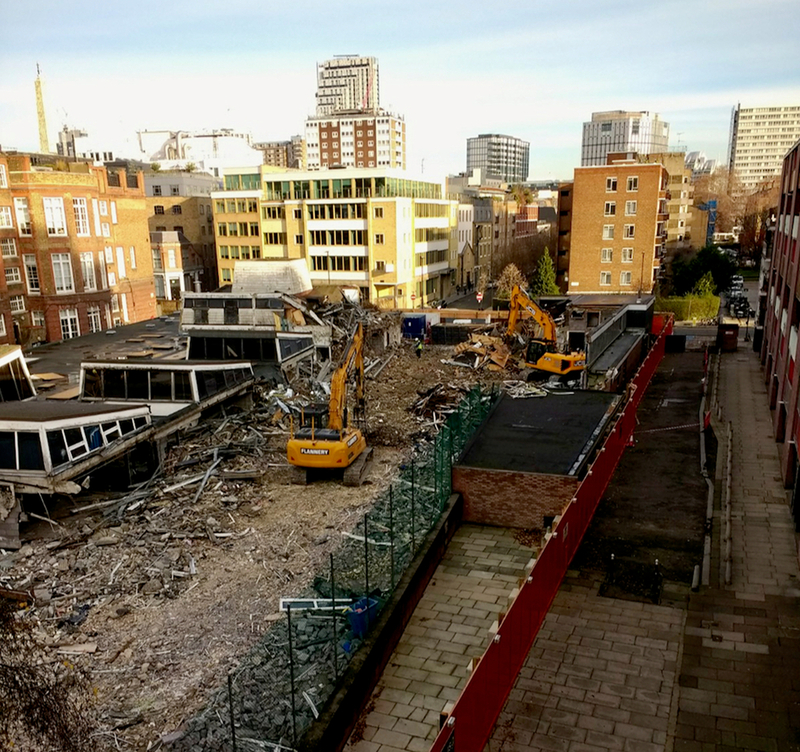 Here on the estate, the demolition of the former Richard Cloudesley School came to a halt when a JCB accidentally fractured a gas pipe. Not an earthquake exactly, but tremors were felt just before it happened. All of the residents of nearby Basterfield House were evacuated to the local school. Medics arrived and investigations began as to how so many people came so close to disaster. Some days later, residents picked off their doormat a letter from someone in the City Corporation housing department offering a flimsy apology and a plea to not jump to conclusions about the cause of the incident. That particular horse had already bolted. Residents rightly believed they’d had a lucky escape so were stunned when work continued on the site soon afterwards with no guarantees of future safety or any indication that lessons had been learned. The estate is currently in a vice-like grip of building work over which residents have had little say. It’s been dubbed ‘A Tale of Two Cities’. 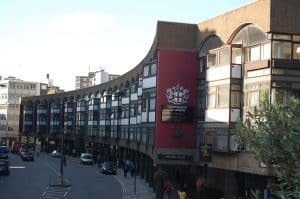 The Richard Cloudesley site is to become a monster residential tower block taller than Greater Arthur House, to be shared equally by City of London and Islington tenants, plus a primary school. 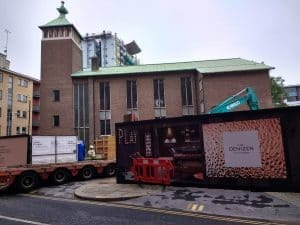 100m down Golden Lane is the site of the former Bernard Morgan House, where another gigantic block, The Denizen, is under construction; this one offering suites of luxury apartments to rich overseas clients as an investment opportunity. Nobody expects to see any of these new residents in the Two Brewers, Cliffords the barbers, or shopping for lunch in Whitecross Street Market. They are expected to be invisible, which puts them alongside the estate’s resident heron. I wrote about this elusive bird some months ago, describing it as lurking hungrily around our revamped fish pond. I’ve since learned that this was fake news, because the heron was in fact a fake heron, its skinny legs cemented into a concrete block. It eventually found a home, fittingly, in the shallow waters of the pond, but not for long because, as well as being gripped by development work, the estate is now enthralled by the ‘Mystery of the Missing Heron’. Someone’s nicked it. There is said to be incriminating CCTV footage, but no one is quite sure where the camera’s rewind button is, so the mystery remains an enigma wrapped up in a riddle. All of this brings a lighter note to what are heavy times. The TOWIE rendition of Shakespeare’s The Merry Wives of Windsor at the Barbican set the tone, and the Christmas Day funtime family tea party in the Golden Lane Community Centre added to the seasonal goodwill. It was a great success for yet another resident-led event, though I was quietly staggered by the number of very clever people who were unable to work out how to play bingo. They weren’t much better when the quiz asked them to name the shop on Goswell Road next door to City Hardware. The free raffle was a hit. I won six freshly-laid eggs from the chickens they keep at St Luke’s Community Centre on Central Street. After that, not winning the luxury hamper was a disappointment I could live with. of the surface of Mars. Tenerife has its fair share of controversial building projects, too. Close to where we stay in the quiet end of Los Cristianos (the south) is an apartment block some claim illegally breaches planning regulations; 200m away is a newly built parade of what were meant to be luxury shops. They stood empty for two years, then they were occupied by a ragtag group of counterculturals. Today, the hippy colony is still hanging in there and the buildings look like they’ve found a niche in the local life of Los Cris. I’m sure these new residents are a headache for local planners and business people seeking a nice profit, but with luck their example will make the local power-brokers think a bit harder in future. Billy Mann has lived on the Golden Lane Estate for 24 years. He is a City of London Community Builder and blogs about neighbourhood happenings at basterfieldbilly.blogspot.com.